Scented oil refill features a Linen and Sky scent to provide a noticeably fresh cloud of a fresh-off-the-clothesline scent. Unique odor converters transform the structure of malodors to prevent your nose from detecting lingering smells in the air. Long-lasting scent cleans away stinks for 1,200 hours on the low setting. 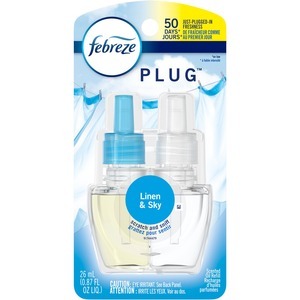 Scented oil refill is compatible with both the classic and newly redesigned Febreze oil warmers (sold separately).